One of the most dangerous situations bikers experience on the road is attempting to merge into a lane with a car, SUV, or truck in its blind spot. 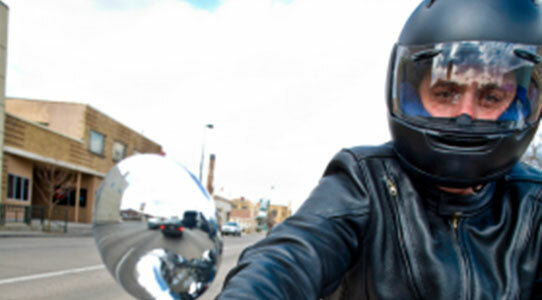 Whether you're traveling on the highway or riding around on back roads, blind spots can lead to painful injuries and devastating motorcycle accidents. Upgrading your bike with mirrors that offer larger fields of view will help make you more aware of your surroundings so you can avoid potential riding disasters. If you like your bike to stand out against others, you may want to go with a custom mirror. But remember -- while there are a variety of options for custom mirrors, they provide only a slightly larger field of rear vision than most stock options. Flat glass mirrors will give you a more realistic idea of the distance of objects behind you, but the rear view will not be as large as some other options. Convex mirrors, on the other hand, will provide you with a larger rear view, but objects will appear much smaller -- making them seem like they are farther away than they actually are. How about a helmet mirror? These mirrors, which are literally attached to your helmet, provide you with an image of objects behind you that is completely to scale. They will even maintain their position when you're traveling at higher speeds, like on a highway. Pig Spotter mirrors are great for bikes that have already been customized to include bold colors such as red, green, and blue. Each mirror has LED lights that can be used as turn signals. They can even be purchased with airbrushed designs. Polarized mirrors help reduce glare from the sun while improving your rear view. Ever come out to find your bike with lopsided or bent mirrors? Folding mirrors could be the right fit for you. They fold down, reducing bent and broken mirrors.